SignalFinder is a multicurrency indicator displaying trend direction for several currency pairs and time frames on a single chart. The indicator is installed on a single chart. The trend is defined at the last complete bar. This is a demo version of SignalFinder. It displays 30% of information only. TimeFrames - time periods (time frames). 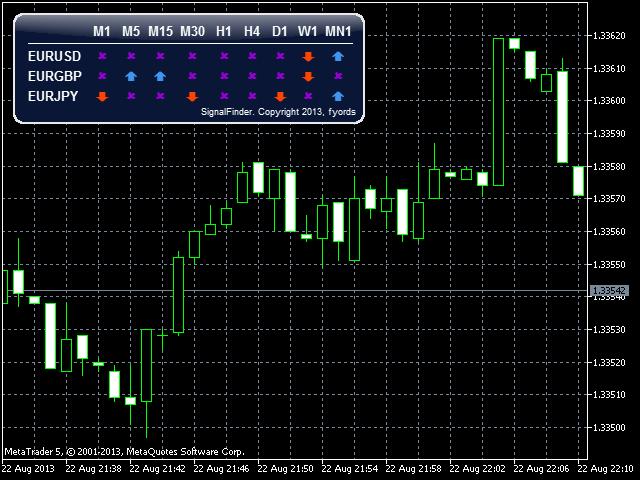 Ranking is sorting currency pairs on the basis of the stability of a signal. Calculation in a row is done from right to left. Currency pairs and time frames are separated by comma in the list. If a currency pair or a time frame does not exist or is mistyped, it is marked in crimson in the table. Blue arrow up - the last closed candlestick is a bullish one. Red arrow down - the last closed candlestick is a bearish one. Gray dot - open price is equal to the close price of the last closed bar. Yellow dot - loading history.